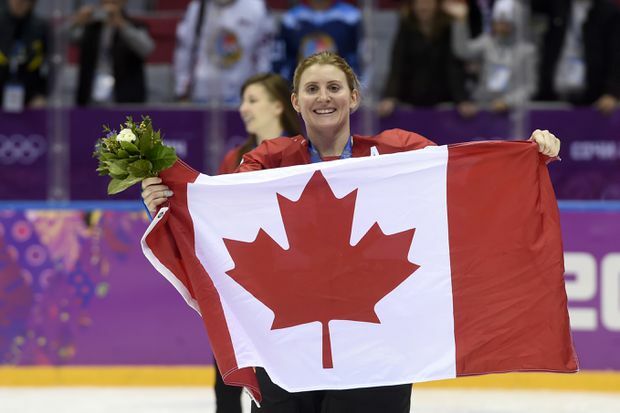 Hayley Wickenheiser celebrates with the Canadian flag after beating the USA 3-2 in overtime at the Sochi Winter Olympics in Sochi, Russia in 2014. Wickenheiser is the Toronto Maple Leafs new assistant director of player development. Late-summer hiring announcements from National Hockey League teams seldom draw attention. Although, in fairness, this one does involve a surefire Hall of Fame player joining the storied Toronto Maple Leafs. Her name is Hayley Wickenheiser, and she will be assistant director of player development. The club is also adding Noelle Needham, a former collegiate player from South Dakota, to its scouting staff. It’s about time. The culturally hidebound NHL may not be exclusively male, but it’s not far off. Six teams employ women as skating consultants or in their analytics and video operations, but women have been almost entirely absent in player development and scouting – critical areas in the salary-cap era. Ms. Wickenheiser is a four-time Olympic hockey champion from Shaunavon, Sask., and one of the greatest players in history. Ms. Needham ran a training program for elite players for nine years and co-founded a minor hockey club. Their hockey knowledge takes a back seat to no one, yet neither has been offered an NHL job until now. There is no valid reason for this. That both landed with the Leafs is no accident. The hockey club’s Maple Leaf Sports and Entertainment basketball stablemate, the Toronto Raptors, is also at the forefront of gender diversity. The Raptors recently added Tamara Tatham to the staff of its development squad, making her the first Canadian woman to coach in a major North American men’s pro league. It helps that people making the key decisions for both the Leafs and Raptors break the mold. Raptors president Masai Ujiri grew up in Nigeria and views social activism as part of his job; new Leafs general-manager Kyle Dubas is a hockey lifer, but he is also 31 – a generation younger than all but one of his peers. Mr. Ujiri likes to say his rationale for hiring women is based less in equality and opportunity than in exploiting market inefficiencies: Why not cast the widest possible net for new ideas? Mr. Dubas has evidently been listening.